Gerry Adams has stepped down as leader of Sinn Fein after more than 34 years at the party's helm. Elected in 1983, the 69-year-old is the longest-serving leader of any political party in the UK and Ireland. He announced his intention to stand down in November, when he said he had "complete confidence in the next generation of leaders". At that time he had also said Sinn Fein would be working towards a unity referendum to be held within the next five years. 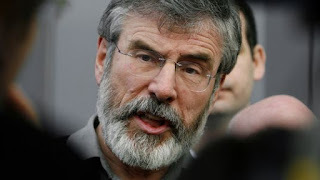 Speaking on his last evening as leader, Mr Adams said: "A united Ireland has to be worked for. "Sinn Fein is about bringing the people of this island together in a new Republic, a new Ireland in which the rights of citizens are protected, where poverty is eradicated and where we can all live in peace and unity and equality. "Fifty years ago when I joined Sinn Fein, it was a banned party. "The nationalist people of the north had been abandoned and were subject to discrimination and inequality. We were on our knees. We are now off our knees. "We have a Good Friday Agreement. It is in some difficulty at this time but it offers the way forward. "There is now a peaceful and democratic path to Irish unity, a way to unite Orange and Green and end division. "Everyone who wants a new and agreed Ireland should embrace that." He added: "I believe the future is bright. I believe that we will find a way forward." Are You Ready To Test Your Proofreading Skills?